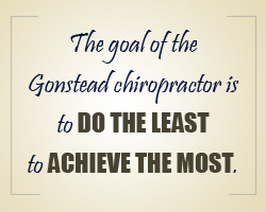 The Gonstead System of chiropractic was developed by Dr. Clarence S. Gonstead of Mt. Horeb, Wisconsin begging in 1923. He refined his unique system over a 55-year period. The Gonstead System focuses on being as specific as possible with the examination and treatment of the patient. The examination includes taking a detail history, instrumentation, static palpation, motion palpation, neurological testing and often times, full spine x-rays taken in the standing, weight bearing position. Necessity of x-rays is determined during the functional examination. Treatment is done by administering a very specific hands-on adjustment. By using his or her hands as adjusting tools, the Gonstead practitioner is better able to sense the relaxation of the patient and to control the direction and amptitude of the adjustment needed for each individual patient. No mechanical instrument can match the sensitivity of feel of timing of an applied force from a skilled chiropractor's hands. The goal of the Gonstead practitioner is to "do the least to achieve the most". That is to say, the least amount of segments to be adjusted with the least amount of force the least amount of times. This is case specific to each patient. The Gonstead Chiropractor does not treat every patient with the same manipulative procedure of twisting the neck and lower back from both the right and left and the middle back from top to bottom. Every patient is a unitque case with specific subluxations and must not be given the same course of manipulation. That type of approach could potentially harm individuals with too much impact to the joints of the spinal column and result in neurological insult. The Gonstead chiropractor believes that chiropractic care is not scientific unless the adjustment is specific. The Gonstead System has hundreds of years of combined clinical experience and has been tried and tested. Through the process of deductive science, the Gonstead chiropractor is confident that if subluxations are found during the functional examination, he or she has a specific protocol for treatment with an expected result. Furthermore, if a need for additional evalution is found necessary, he or she will refer the patient to the appropriate doctor or therapist. to ensure that the needs of each patient are properly met.